End-of-the-year switch • UDOT is taking comments but says it hasn't found any valid arguments against the move. Steve Griffin | The Salt Lake Tribune Traffic on I-80 near 1700 east in Salt Lake City, Friday, November 14, 2014. Trent Nelson | Tribune file photo Rush hour traffic northbound on I-15 in Farmington. A new study says the average Salt Lake-area commuter last year experienced 37 hours of congestion-caused delay and had related expenses (fuel and time) of $1,059. Steve Griffin | The Salt Lake Tribune Traffic on I-80 near 1700 east in Salt Lake City, Friday, November 14, 2014. 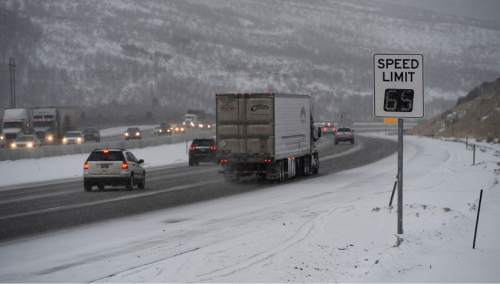 Francisco Kjolseth | The Salt Lake Tribune Traffic rolls along I-80 in Parley's Canyon on Tuesday, Jan. 7, 2013, where UDOT has been switching to new electronic speed limit signs that will change the limit according to conditions. 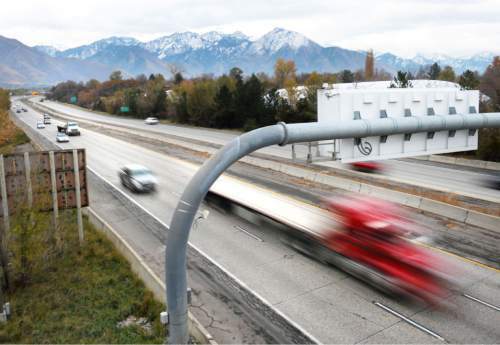 Price • The 65 mph speed limit along Utah&apos;s urban interstate freeways is about to rise to 70 mph. 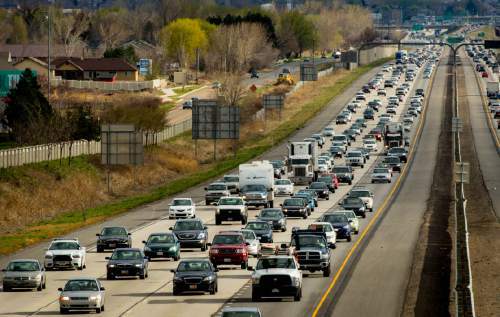 The Utah Department of Transportation proposed the change Friday to the Utah Transportation Commission at a meeting in Price, and then formally solicited comment from cities and counties along the Wasatch Front. "Barring any surprises, I would anticipate the change taking place in mid- to late December," said Jason Davis, UDOT chief of operations. "However, if someone presents information that we have overlooked or misinterpreted, then we would reexamine that decision." The Legislature this year passed HB80 by Rep. Jim Dunnigan, R-Taylorsville, to allow UDOT to study speeds throughout Utah&apos;s interstate system and raise them where appropriate. UDOT started by studying Wasatch Front freeways. Davis said it found drivers there already are traveling faster than 70 mph. "We&apos;re not changing the speed of the driver. We&apos;re changing the posted speed limit," Davis said. "We&apos;re just bringing the speed limit into compliance with what they are already doing." He said that while many people assume raising the speed limit will also increase the speed of all traffic by about 5 mph, studies have shown that is not the case. For example, in rural areas where the state in recent years increased limits from 75 to 80 mph, studies showed actual speeds increased by only 1-2 mph on average. "Our studies have shown that when we increase speed limits, the traveling public is already driving what they are comfortable with and that it just brings more of those folks into compliance," he said. Davis said besides studying prevailing speeds, UDOT looked at crash data and roadway geometry  and applied engineering judgment to what roadways can safely handle. He said only two small segments of Wasatch Front interstates between Ogden and Spanish Fork will remain at 65 mph. One is Interstate 80 in Salt Lake County between Bangerter Highway and the interchange with Interstate 15. He said a sharp curve at the I-15/I-80 interchange forces the slower speed in that area and on the approaches to it. The other area where a 65 mph limit will remain is on I-80 between 1300 East and the mouth of Parley&apos;s Canyon. "Folks there are not traveling that at a higher rate of speed, so we are not recommending that we change the speed limit there at this time," Davis said. Also, while State Road 201 is a freeway in Salt Lake County, it is not part of the interstate system  so HB80 did not allow raising its speed limit. It will remain at 65 mph, he said. Davis said UDOT does not expect the higher speed limit to create any more air pollution, increase gasoline usage or cause any more severe accidents. The reason: "People are already driving that speed," and he doesn&apos;t see the higher limit as actually changing any behavior, only increasing compliance with the posted limit. 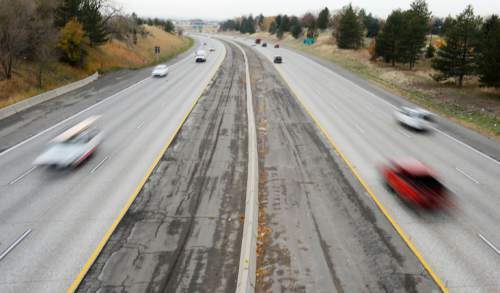 HB80 had also allowed UDOT to study other interstates statewide, and increase limits up to a possible 80 mph. Davis said UDOT began studies on the Wasatch Front, but is currently studying other areas  such as around St. George. He said UDOT is not yet prepared to propose any additional speed-limit increases. Davis did urge drivers to remember that it is not always safe to drive as fast as posted speed limits. "Just because the road is posted at a certain speed limit doesn&apos;t mean that&apos;s the speed you drive all the time. If the conditions are such that you should not be driving that fast, then you need to slow down." He added studies show that "the majority of the speed-related crashes that were occurring were during poor conditions. So the drivers who may have even been driving the speed limit were driving too fast for conditions." Rolayne Fairclough, spokeswoman for the AAA insurance and travel services company, was the only person to testify against HB80 at the Legislature this year, saying it could increase danger. She was not happy to hear about plans to increase urban speed limits  and hopes UDOT will reconsider. "If you calculate the time you are going to save by driving 70 instead of 65, it&apos;s a negligible savings. But you put yourself into far greater danger because you have reduced your reaction time, and you have increased the forces in a crash," she said. "Speed is the largest contributor to crashes in the state," she said, adding it makes little safety sense to increase speed limits. Of note, while 65 mph has been the default speed limit for urban freeways, 75 mph has been the base limit in rural areas  although about 300 miles of Utah interstates now have an 80 mph limit. In testimony on HB80 earlier this year, UDOT and Dunnigan had said no fatalities had occurred in the 80-mph zones. However, The Tribune found shortly afterward that 16 fatalities had occurred there since limits were raised  but UDOT said most were not speed-related, and those that did happen likely would have occurred whether or not the speed limit changed.